Stay at Home Blessings: Are Your Kids Drinking Enough Water? 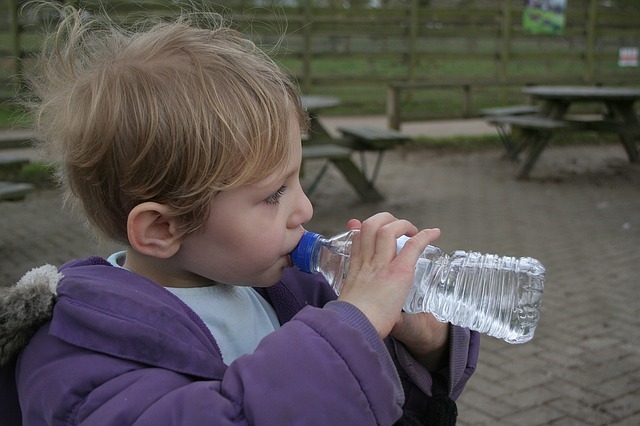 Are Your Kids Drinking Enough Water? Now that summer is here again, kids lose more body water. If they don't drink enough water, they might suffer from dehydration. How do we know whether they are drinking enough water? Is the 8 glasses of water a day enough? It depends on how active the kids are. The more active they are, the more they will sweat and lose body water. So, how do we know if they may be dehydrated? 1. Watch out for the physical signs: The lips are dry and the mouth feels a bit gummy or sticky. 2. Watch for other signs like difficulty concentrating on tasks; feeling tired for no reason at all; a bit elevated heart rate and having headaches. 3. Check the quality and quantity of their urine. When the urine color is dark and has a strong odor, it is a strong indication of dehydration. (Take note that medicine, multivitamins, some foods or beverages sometimes influence this.) Low urine volume over the course of a day is also associated with dehydration. Watch this video which gives a very clear explanation as to how dehydration can be prevented especially in kids.